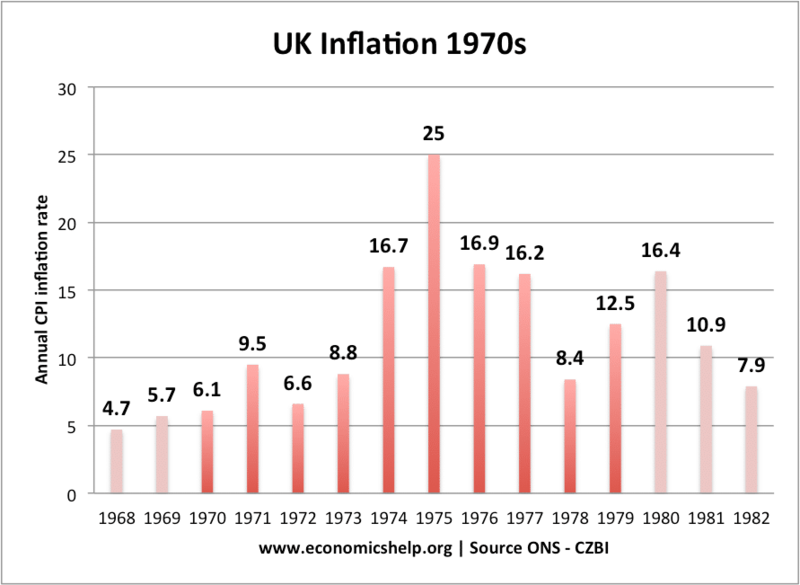 In the late 1970s, inflation had continued to be a problem; with a combination of rising oil prices and rising nominal wages. 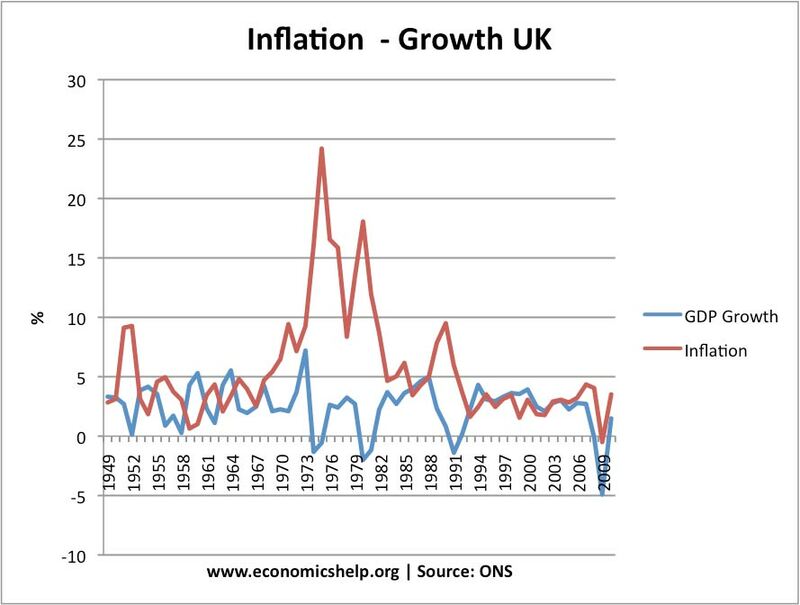 Again the government sought to control the wage inflation by imposing wage caps. But, again the unions were in no mood for stiff wage settlements. Strike action broke out across the country, extending from the industrial heartlands to the public sector. Public servants from dustbin men to grave diggers in Liverpool went on strike. Unburied coffins in Liverpool piled up, and in cities across the UK, garbage went uncollected. Not for nothing, was that period of strike action called the 'Winter of Discontent'. It seemed the government was unable to control either inflation or the strike action. A feeling of powerlessness pervaded the country. 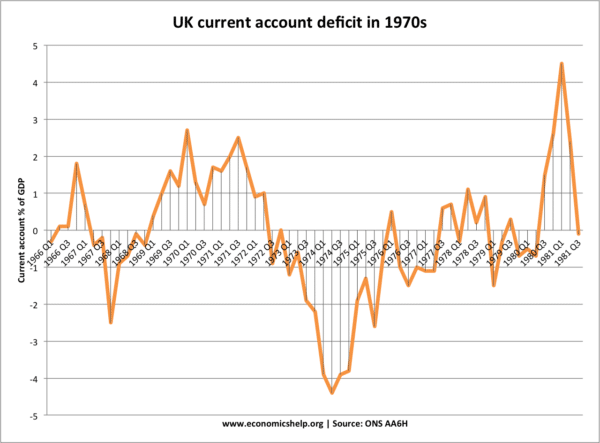 In some regards, the economic situation of the 1970s was not quite as bad as the dramatic Winter of Discontent suggested. Certainly the three day week was a radical event. But, it was relatively short lived. The 1970s was a period of rising living standards. Nor is the 1970s a vindication of monetarism and proof of the failure of Keynesianism. 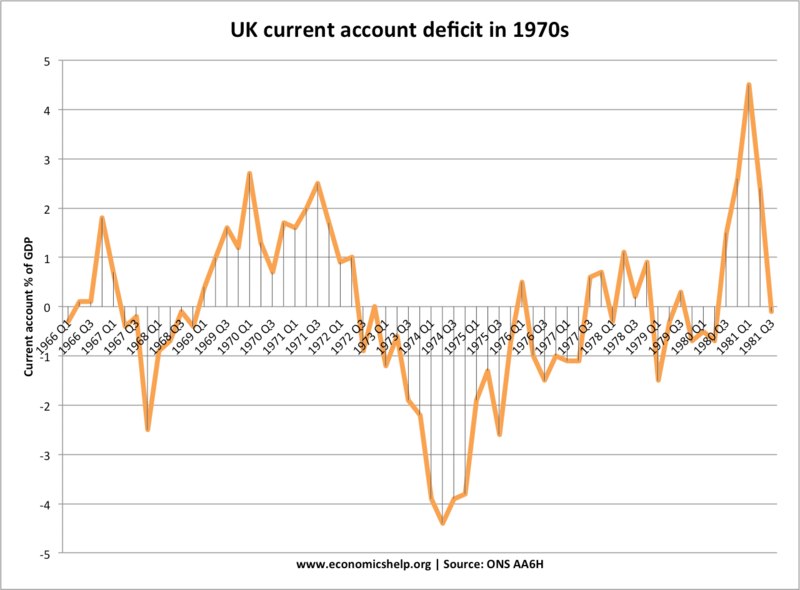 See: How Really bad was the 1970s? The 1970s was a period of rapid house price growth, especially in the early 1970s. MIRAS - tax relief on mortgages, encouraged people to get a mortgage. 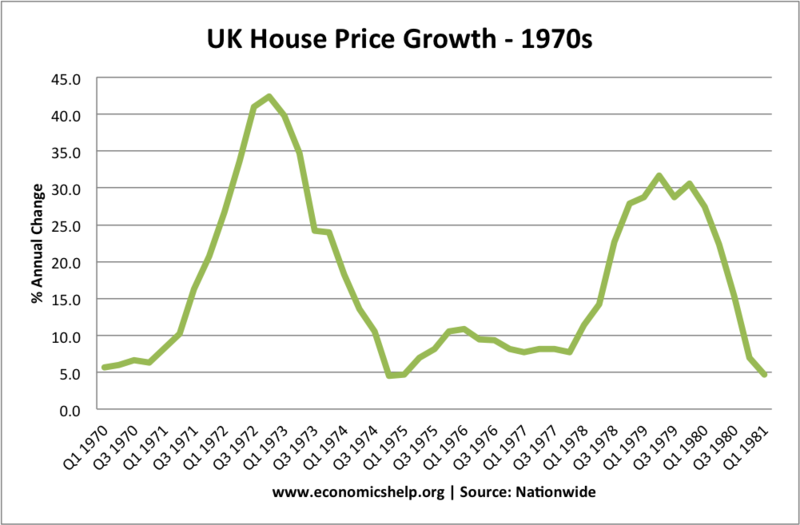 Real house prices adjusted for inflation, stayed constant in second half of 1970s. 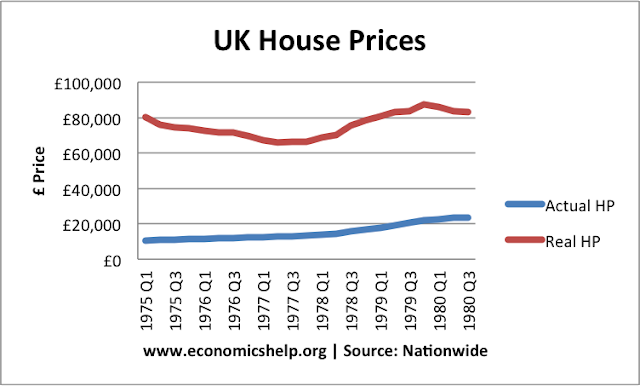 Annual % growth in house prices. 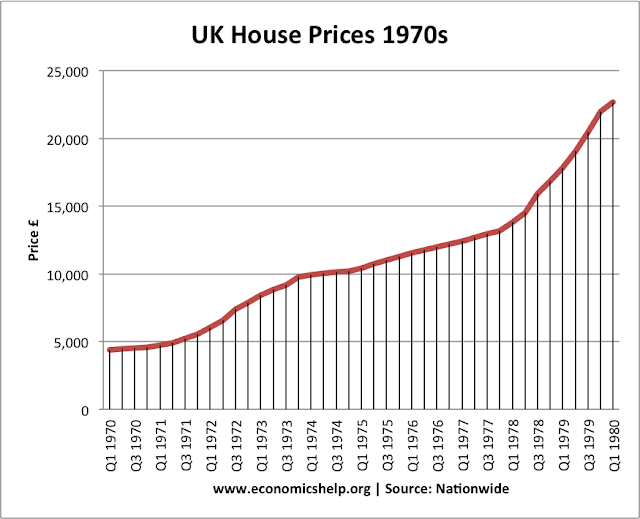 In the second half of the 1970s, real house prices fell between 1975 to 77 because they struggled to keep up with record inflation. However I wasn't able to find the data on the ONS website. Could you send a link where to find that? House prices started to rise after the Tory Party abandoned Schedule A Tax in 1963, which taxed the increased values of LAND. It took the tax directly out of income tax. Now, gains from land were tax free. Money poured into unproductive land and not into productive enterprise activities. House prices rose. Also coupled with the Stalinist T&C planning act an artificial land shortage was created. Prices went even higher. Tory chancellor Barber in 1970/71 making credit easier to buy homes (LAND), again encouraged money to pour into unproductive activities - LAND. economically harmful. An increasing concentration of wealth and/or income indicates that privilege is in the ascendant over production, and rent seeking from land commensurately more profitable than the productive labour and capital goods investment that produce economic growth. 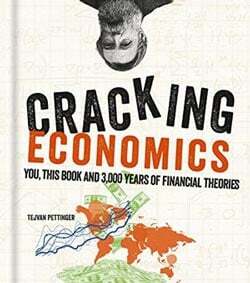 As rent seeking (in unearned gains from land & its resources in rent seeking or windfall land gains) squeezes out production, especially productive investment, the whole economy is made poorer. Most people have no idea that there is a difference between productive investment and rent seeking. A simple tax shift can redirect money into productive economic growth investment, not harmful tax free rent. That tax shift is Land Valuation Taxation coupled with no Income tax. Harmful land speculation is curtailed and production is rewarded by no Income and Sales taxes. There is a comment in the article as follows; "Belatedly, the government tried to deal with unemployment, through higher interest rates"
Increasing interest rates will increase unemployment. Can someone explain?